Aloha! We are Julie and Randy and welcome to our home! We want you to enjoy the fantastic ocean views and luxury of our remodeled 2-bedroom, 2-bathroom condo in Wailea Elua Village - a gated, 24-acre, oceanfront community on beautiful Ulua Beach in Maui. You should also know that our listing is one of the few truly “by owner” Wailea Elua Village properties on VRBO and HomeAway. Believe it or not 85% of the Elua Village listings on these sites are managed and operated by vacation rental management companies on Maui, where a guest will have no interaction with the actual owner of the condo. In contrast, Julie and I personally handle and manage every single VRBO and HomeAway inquiry and booking for Elua 701. If you book our condo, or send an email to ask a question, you will interact directly with us, not a management company. After all, isn’t VRBO supposed to be Vacation Rental “BY OWNER”? Our home (Elua 701) is perfectly situated in the center of the Wailea Elua Village property. We are only 150 yards from Ulua beach -- just a 90 second walk to the sand and the world famous 2-mile Wailea Beach Walk that connects all the beachfront resorts along the stunning South Maui shoreline. Our condo is centrally located to the upper pool and Jacuzzi area, tennis court and putting green, as well as the newly remodeled and absolutely beautiful lower pool and pavilion area (which is right next to the beach). Additionally, since our condo is in the middle of the village we are far away from all the road noise of Wailea Alanui Drive which runs along the back of the property. Thus, whether you are relaxing inside our home or outside on the large lanai all you can hear is the surf, the birds, and the breeze in the palms. From the moment you walk in the door of Elua 701, you will feel at home in our remodeled condo. You will see the quality touches from the granite counter tops to the cool tile flooring. The open floor plan of the main living area includes the well-stocked gourmet kitchen, the dining area with a bar and chilled wine locker, the expansive living room with an additional sitting area, and an entertainment center with a 46-inch Sony LCD wide-screen TV and a CD/DVD home theater system -- all with a fantastic ocean view. The lanai off of the living room is huge, adding over 400 square feet of outdoor space to the already spacious 1260 square feet interior area of our condo. This outdoor space is partially covered so there is always sun or shade available. The lanai also provides two lounges, a BBQ grill, and a comfortable outdoor dining area for six people. Additionally, there is an intimate bar-height table for two that is truly a special place for morning coffee and evening drinks at sunset. The Master Suite features a new extra-large 'California King' bed, high-thread-count sheets and bedding, 26-inch LCD flat-screen television, DVD player, and over-sized spa bath towels. The large, ocean view, second bedroom has new Queen and Twin beds with high-thread-count sheets, 26-inch LCD flat-screen television, DVD player, and over-sized spa bath towels in the adjacent bathroom. Since this is truly a 'by owner' property, you will receive owner-direct pricing. You will also find our home is lovingly cared for with the greatest attention to detail. Our guests also receive exceptional personal attention throughout the entire inquiry and booking process as well as during their stay in our home, which is something they might not receive from a property that is not directly managed and cared for by the owner. We invite you to read through the Traveler Reviews attached to this listing to see what our guests have to say about the quality of our home and the level of service we provide. We are passionate about Elua 701, not only because it is our second home, but because it is our guest’s home during their vacation on Maui. The quality of your vacation experience in Elua 701 is very important to us, because we know that it is very important to you. While Julie and I personally handle and manage all details of your booking, we also have the support of a guest services company on Maui that provides the cleaning and maintenance services required to maintain the high standards we insist upon. The support of this company is available to our guests during their stay in Elua 701 should there be a question or issue that Julie and I cannot immediately answer or resolve from our home in California. Please note the Wailea Elua Village Homeowner’s Association requires a minimum stay of 5 nights for all vacation rentals. We do not offer daily maid service. All bookings are subject to a check-out cleaning fee of $203.14. For stays of 14 nights or more, mid-stay cleanings will be conducted on a nominal 7-day interval. The cost of a mid-stay cleaning service is $130.22. All bookings are also subject to the Wailea Elua HOA guest check-in fee of $104.17. Our home has all the usual amenities that you would expect... and more! And don't forget about all the things to do! 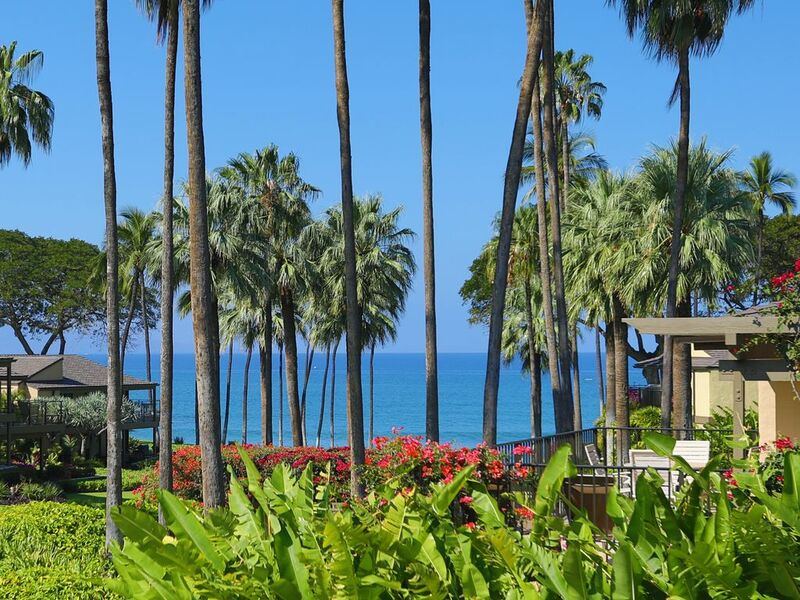 We chose the Wailea Elua Village for many reasons. Elua is a gated, oceanfront complex situated on a gorgeous, white sand beach called Ulua Beach. Additionally, the grounds at Elua are absolutely spectacular with orchids growing on almost every tree. Also, we love SCUBA diving, and Elua Village is less than 1-1/2 miles from the Kihei Boat Ramp where all the dive and snorkle boats depart for Molokini Crater and all the other great South Maui dive sites! Finally... that beach we were married on... was Ulua!! New central air conditioning installed in February 2011. 500 thread count sheets, over-sized spa bath towels, and beach towels included. New full-sized front loading washer installed in March 2018. New full-sized front loading dryer installed in August 2012. Covered parking available steps from our front door. Beach towels are provided for our guest's use. Fitness Room available at the Elua Village Main Pool & Pavilion area. Free and secure wireless broadband internet. New dishwasher installed August 2012. New refrigerator installed November 2016. New stove installed November 2016. New oven installed November 2016. New microwave installed November 2016. New dishes and flatware in February 2018. Kitchen cabinets refaced in bamboo in November 2016. All rates are subject to an additional 14.42% Hawaii State Tax (#TA-043-589-8368-01, #GE-043-589-8368-01). $500 damage deposit -- refundable. Elua Village requires a 5 night minimum stay -- no exceptions. From December 16th to January 5th, a 14-night minimum stay is required. Deposit of 25% is required to confirm a reservation, balance is due 60 days prior to arrival. Deposit is refundable less a $150 handling fee if cancellation is received 60 days prior to arrival date. For cancellations received within 60 days of arrival or after arrival date, all payments will be retained.